Knight, Christopher. “Valerie Jaudon’s paintings: The more you look, the more you’re pulled into her world,” Los Angeles Times, October 10, 2016. Valerie Jaudon was recently elected to membership in the National Academy of Design. The National Academy was founded by Samuel F.B. Morse, Rembrandt Peale, Asher B. Durand and Thomas Cole in 1825 and was modeled on the Royal Academy in London. National Academicians are drawn from the fields of fine art and architecture. Visitors to the Birmingham Museum of Art already know that the Ireland Sculpture Garden is a great place, but now it’s official. 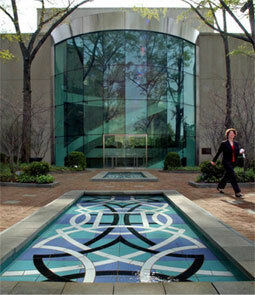 The American Planning Association has named the museum’s outdoor garden one of 10 Great Public Spaces for 2010. Part of its Great Places in America program, it is the first such designation for Alabama. The Chicago and Washington, D.C.-based organization based the award on the garden’s plan and design that meld art with the natural landscape. It also cited its accommodation of all types of visitors, including the visually impaired. The garden’s overhanging trees, Valerie Jaudon-designed blue pool and benches and surrounding sculptures by well-known artists such as Auguste Rodin, Fernando Botero, Sol LeWitt, Alexander Archipenko and Salvador Dali make it an idyllic spot for museum visitors. Containing three distinct spaces, the 30,000 square foot space was designed by architect Edward Larrabee Barnes and sculptor Elyn Zimmerman and created as part of a $21 million renovation of the museum in 1993. Andrews hoped the award will remind people to take advantage of the garden.